BlackBerryOS.com - BlackBerry KEYone Coming to Canada and the US on May 31st! An unlocked version will be released in the US, with support for GSM and CDMA carriers. Sprint and Verizon customers rejoice! The KEYone will also be sold by US carriers later in the year. As for Canada, pre-orders from Bell, Bell MTS, Rogers, Sasktel, and Telus Business will go live on May 18th, with units in customers' hands on May 31st as well. The keyboard-equipped device will cost $199 on-contract. What is your favourite part of the KEYone? Sound off in the comments! Mine's the programmable key shortcuts (which wouldn't be possible without my other favourite part of the KEYone, the keyboard). See below for Canadian press release. IRVINE, Calif. and TORONTO – April 27, 2017 – As one of the highlights of this year's Mobile World Congress, the BlackBerry KEYone captured global attention and acclaim, ushering in a new era of BlackBerry smartphones. Today, TCL Communication, a leading global smartphone manufacturer and global smartphone licensing partner of BlackBerry Limited, is announcing that the BlackBerry KEYone will officially be on-sale in Canada next month at Bell, Bell MTS, Rogers, SaskTel and TELUS Business starting at $199 CAD on a two year term. Ahead of next month's official on-sale date, the BlackBerry KEYone will be available for pre-order starting May 18 from select partners. "After all the anticipation and positive response received from the BlackBerry community on the BlackBerry KEYone, it's an honor to offer this all-new Android-powered BlackBerry smartphone to customers across Canada," said Steve Cistulli, President and General Manager for TCL Communication (TCT), North America. "The BlackBerry story has such a rich history here in Canada, and we're proud to be part of the new evolution of BlackBerry smartphones that reimagine how we communicate and stay connected with a device that is so distinctly different." "BlackBerry fans in Canada will be extremely excited to have the BlackBerry KEYone available in their market," said Alex Thurber, Sr. Vice President and General Manager of the Mobility Solutions at BlackBerry. "Anyone who is an Android loyalist and values the mobile security and productivity that BlackBerry software brings will love this smartphone." An iconic BlackBerry smartphone made for the modern user, the BlackBerry KEYone combines a sleek aluminum frame and soft grip textured back built to offer the best in durability. It also has a 4.5-inch touch display that features Corning® Gorilla® Glass 4, offering greater impact and scratch resistance. The BlackBerry® KEYone reimagines how we communicate with a Smart Keyboard that goes beyond typing. Up to 52 customizable shortcuts transform each letter key for quick access to your favorite apps and most important contacts. Touch navigation responds to touch gestures like a trackpad, to quickly scroll through webpages or emails. Flick typing offers predictive text, made even faster with the ability to flick words onto your screen as you type. The device includes the world's first keyboard-embedded fingerprint sensor conveniently located in the spacebar and provides added device security. Featuring the largest battery ever found in a BlackBerry smartphone, the BlackBerry KEYone offers all-day use and then some, with up to 26+ hours of mixed use, thanks to the 3505mAh battery. Qualcomm® Quick Charge™ 3.0 technology enables up to 50 percent charge in roughly 36 minutes. In times when you only have a few moments to charge up, BlackBerry® Boost is optimized to get you the most charge with the limited time you have. What really sets a BlackBerry smartphone apart from any other Android device, are the enhanced security features built into every device, right from the start. 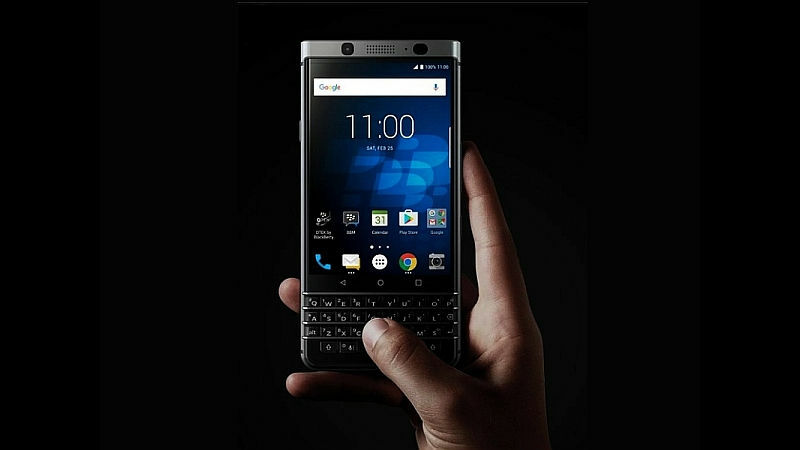 From a hardened operating system to BlackBerry Limited's proprietary technique for establishing a hardware root of trust adding security keys to the processor, the BlackBerry KEYone is designed to offer the most secure Android smartphone experience possible. This device comes pre-loaded with DTEK™ by BlackBerry, offering constant security monitoring and protection of your operating system and apps by letting you know when your privacy could be at risk and how you can take action to improve it. A quick glimpse lets you see the overall security rating for your device and provides simple access allowing you to easily improve your security status. This BlackBerry security application monitors your other apps, alerting you if one is accessing your camera to take a picture or video, turning your microphone on, sending a text message, accessing your contacts or location. The BlackBerry KEYone includes a 12MP rear camera with an industry leading camera sensor (Sony IMX378) that captures sharp, crisp photos in any light. The wide aperture lens with large 1.55μm pixels and dual-tone flash ensures your photos will have superior color and clarity. For times when you have to take a video conference on the go, the device includes an 8MP front camera with fixed focus, LCD Flash, and 84-degree wide angle lens. At the core of this new BlackBerry smartphone is the Qualcomm Snapdragon 625 mobile platform with the Qualcomm® Adreno™ 506 GPU. This means BlackBerry KEYone users will enjoy a powerful combination of optimized battery efficiency and usage and fast LTE speeds for super-fast file sharing. The BlackBerry KEYone will be on-sale in Canada and the U.S. starting on May 31, 2017. For more information about the BlackBerry KEYone and to register for pre-order updates, please visit www.BlackBerryMobile.com.